Last week we had friends for dinner and I planned on grilling fish according to a recipe I learned in Alaska, but of course it rained. 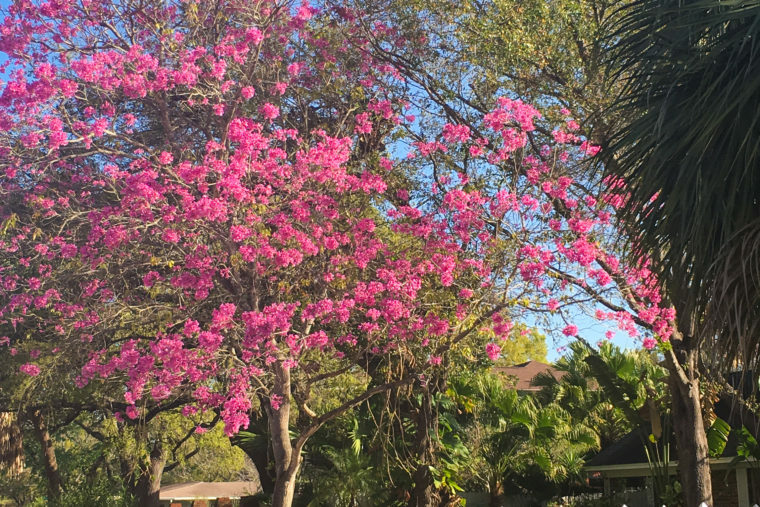 It’s summer in Florida. It rains every day at the most inconvenient time. We went with plan B and it turned out fine, but it just didn’t have that smoky grill flavor I was after. 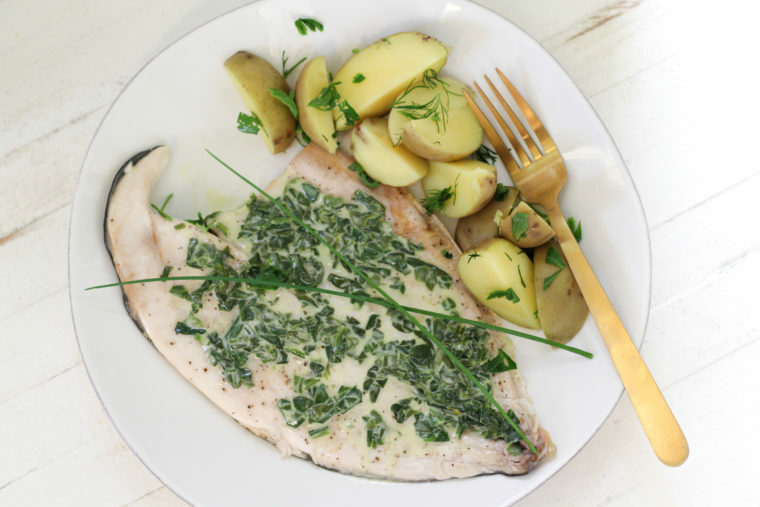 I’m still waiting on a sunny evening to work on that recipe to share with you, but for now, how about dinner you can make rain or shine, with just about any fish you’ve got? 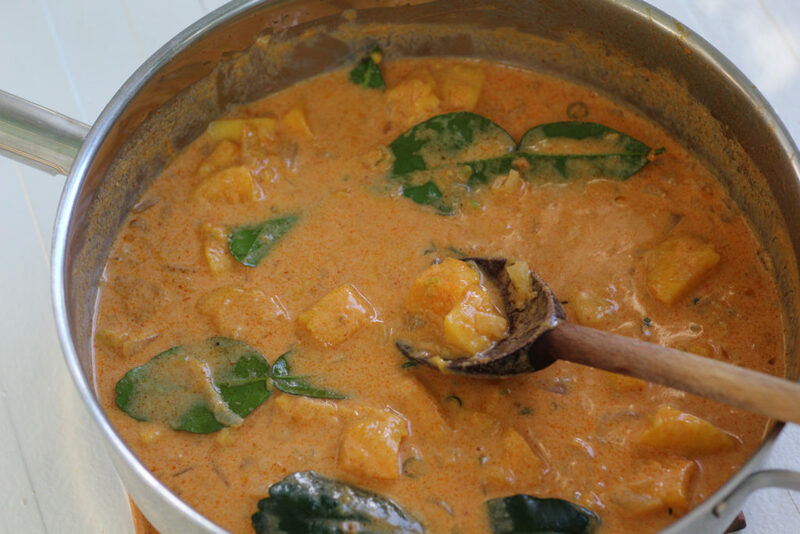 It’s a quick-simmering, summertime curry featuring big chunks of juicy mango. 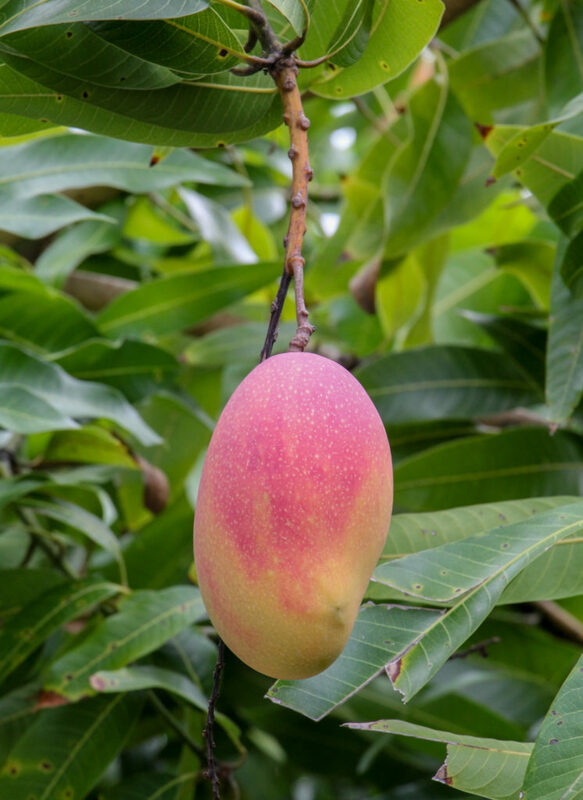 Our early summer mangos fall in the category of “dessert mangos,” which have super-smooth, creamy flesh and sweet, delicate flavor. They’re best eaten out of hand, but whatever you do, don’t cook them. As soon as you heat them they melt away and lose flavor. Now we’re getting into our bigger, bolder, meatier varieties. While they don’t make your eyes roll back in ecstasy while you eat them over the sink, they’re a lot more versatile. I wouldn’t dare put a Glenn mango in this curry, but a Valencia Pride or a Keitt? Hell yeah. 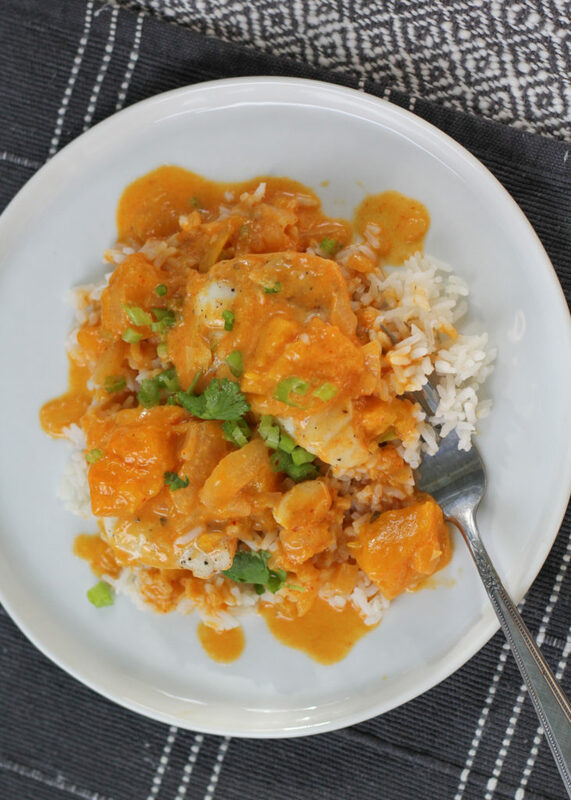 I don’t cook them long (I think overcooked mangos taste like butternut squash), just long enough to heat through and lace the coconut curry with tropical sweetness. As curries go, this one’s easy. It starts off by sautéing a big Vidalia onion until it’s soft, and then some garlic, ginger, and other aromatics. If you leave some out, no biggie. 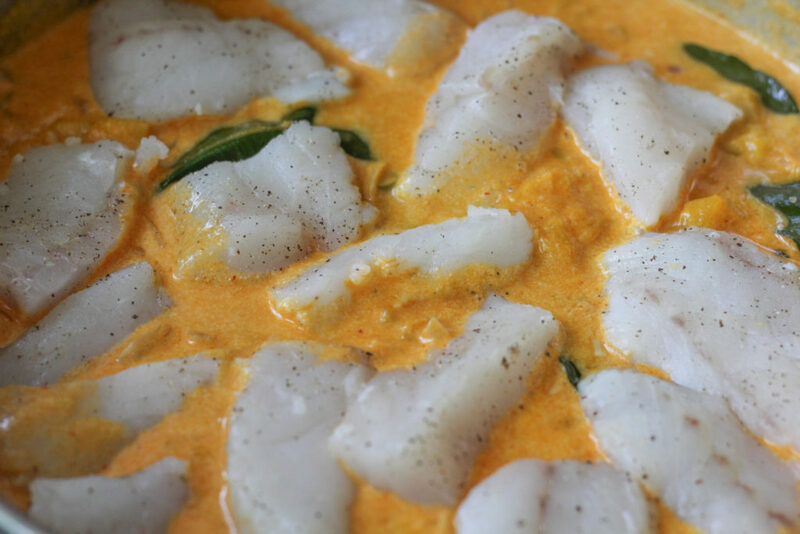 We’re using red curry paste, so if you don’t have kaffir lime leaves or can’t get your hands on fresh lemongrass, there will still be a little hint of it in there. Besides, curry is definitely something you should adjust to your taste while you cook. 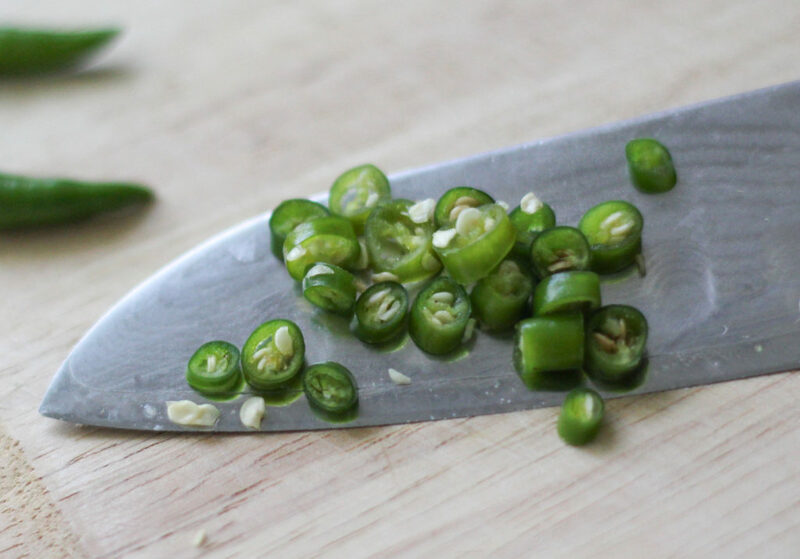 Which reminds me of another optional ingredient: little tiny Thai bird’s eye chilis. Toby always says they “taste like a flower” and while I do like the flavor, they light me up! I use maybe 3, but I always slice up a bunch and put them in fish sauce on the side for him. Sometimes I’m nice. Next swirl in a can of coconut milk along with some fish sauce and fresh lime juice. Let it simmer, then stir in the mango. Once it simmers about a minute, taste and adjust the fish sauce and lime juice to your taste. Now arrange the fish in the pan, cover it, and cook for about 5 minutes. Serve it over rice with cilantro or Thai basil, some sliced green onions, and an extra squeeze of key lime. My recipe card template doesn’t work today so I’m typing it out the old fashioned way. I’ll come back with the pretty format as soon as it’s up and running again. Pat the fish dry. Cut in 2-inch pieces. Sprinkle with salt and pepper. Set aside. Heat the oil in a large skillet or Dutch oven with a lid over medium low. Sauté the onion, stirring often, until it’s soft and translucent. Add cilantro stems and lemongrass and stir for a couple minutes until fragrant. Lower the heat a little, add the garlic and ginger, then stir for about 30 seconds. Swirl in the curry paste and cook for about 30 seconds. 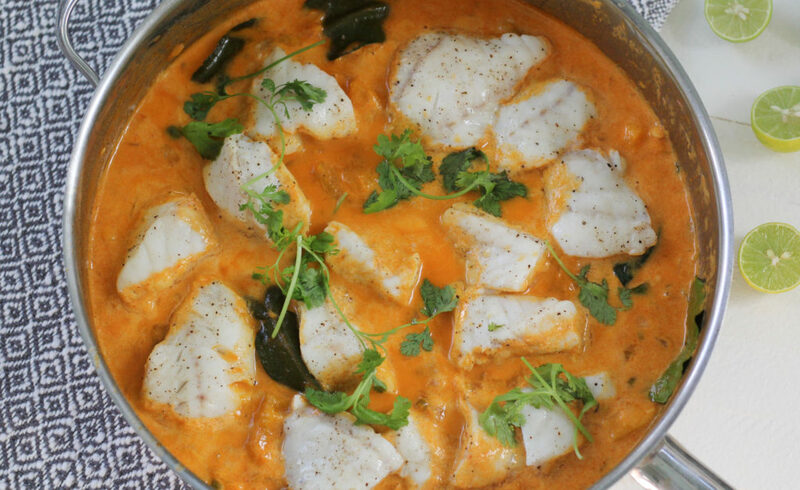 Pour in the coconut milk and add the kaffir lime leaves. Allow it to come to a gentle simmer over medium-low, stirring occasionally. After 6-8 minutes, add the fish sauce, key lime juice, and mango, and allow it to return to a simmer. 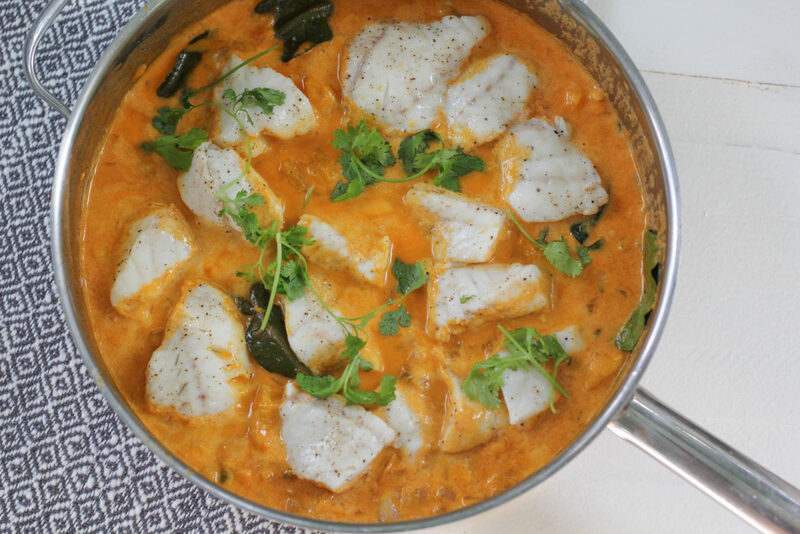 Arrange the fish around the pan and cover for about 5 minutes. The fish is done when a skewer slips easily through the middle of the thickest piece. 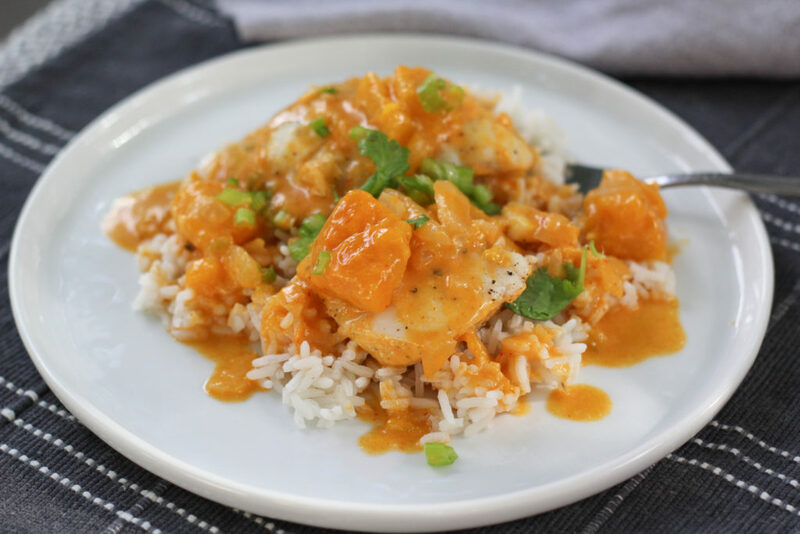 Serve the curry over rice garnished with Thai basil, cilantro, and green onions. 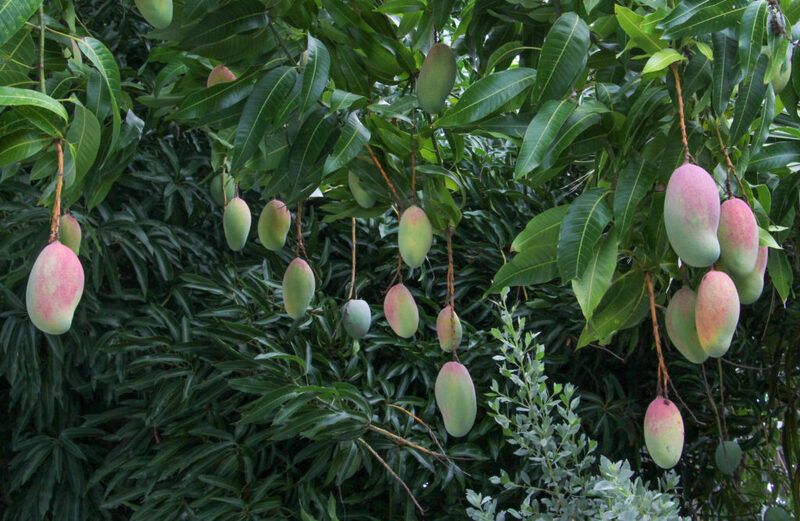 Wow….what beautiful mangos! I have never seen them hanging. 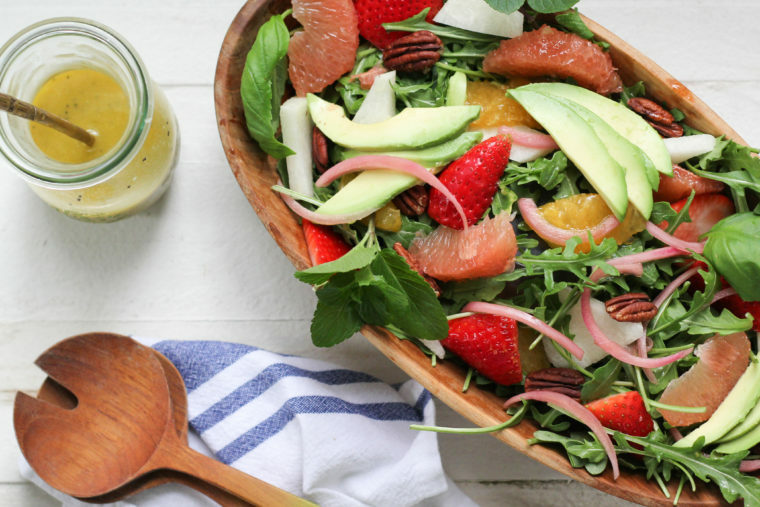 Your mango dish looks delish, very refreshing. I’m going to try your recipe! Thanks for broadening my food horizons. Thanks, Evangelia! I’ll have more mangos to share soon. Just made this tonight…..Halloween! 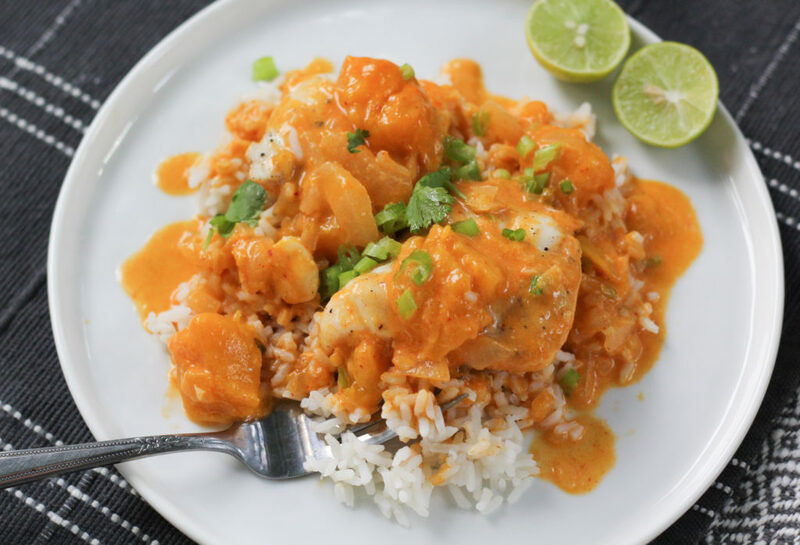 It was so delicious even with a store bought mango, no keffir leaves or lemongrass, and oh yes, I used Key West Pink Shrimp instead of fish. There was a lot of liquid so I served it over rice in bowls and called it a Buddha Bowl. We absolutely loved the flavor!! Will definitely make this again, next time with fish. Do you recommend a firmer fish so it doesn’t fall apart? Thanks so much. You are amazingly talented!